The Canyon Lake High School robotics team wanted a bigger challenge. So it applied for and in December won the 2017 Texas Workforce Commission Grant Award for a Rookie Team. 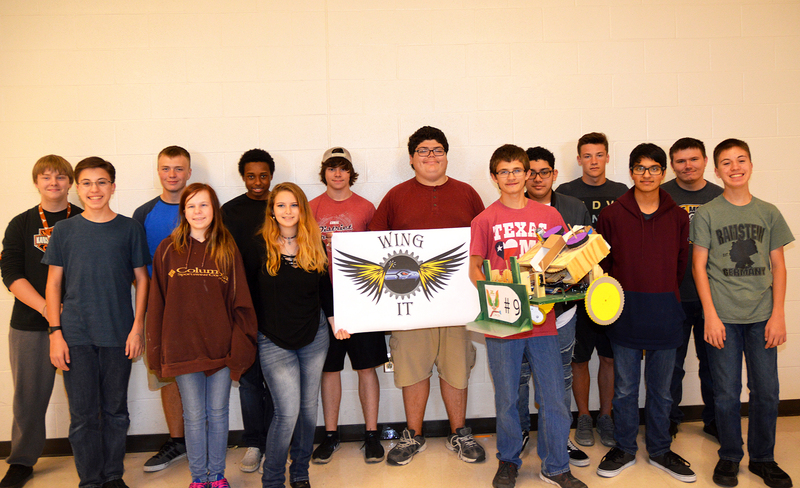 The grant allows the school’s robotics squad “Wing It” to compete in one of the most prestigious events in the state, the “FIRST” robotics competition in San Antonio in April 2018. The grant will pay Canyon Lake High School’s $6,000 entry fee into the FIRST robotics competition. The grant also covers the cost of the robot CLHS enters into the contest. FIRST (For Inspiration and Recognition of Science and Technology) was founded in 1989 to inspire young people’s interest and participation in science, technology, engineering, and math, while building self-confidence, knowledge, and life skills. This is the first year Canyon Lake High School has offered Robotics as a class and not just an extra-curricular activity. Fallin, who is in his ninth year at CLHS, says he’s excited about the momentum the entire engineering program is gaining at the high school. Student Matthew Bell, one of Fallin’s students for three straight years, is a member of the robotics team. He says he loves creating things, and the team is the perfect outlet.